Blog for Canadian Badge Makers – We've got Badge A Minit nailed! Counting down the time until Santa shows up? Here’s a clock button to help! 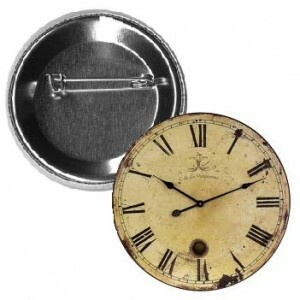 Tick-tock goes the pin-back clock button. A clock button will never need to be winded up – and it’s always correct twice each day. It also doesn’t make any noise, so you can be sure to hear Santa coming down the chimney. This entry was posted in Badge-A-Minit and tagged Badge-A-Minit, badge-a-minute, BadgeAminit, Badgeaminute on December 23, 2013 by Barry Badge. Barry Badge on Want to Make Money? mike on Want to Make Money?